After decades of keeping our subscription rates as low as we could, we are finally being forced to raise them. 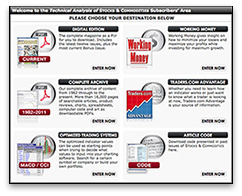 However, the new subscription model gives you full access to more than 12,600 technical trading articles, including our premium S&C Archive, Traders Advantage, and Working-Money.com website sections! MORE THAN JUST A MAGAZINE! Digital Edition — the last 12 issues plus the bonus issue as downloadable PDFs. Complete Archive — more than 16,000 pages of content from 1982 onward available as downloadable PDFs. Working Money — The information you need to invest successfully. Traders.com Advantage — Ideas, insights, evaluations, tips, and techniques that can help you trade smarter. 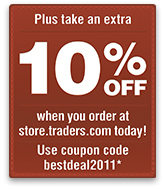 In order to secure the best subscription value, you must renew before January 1, 2012. After that date the new higher rate of $89.99 will go into effect. Don't lose out! Lock in the best deal that you can for as many years as you want today! *Expires December 31, 2011. Cannot be applied to existing orders.